We slept pretty well at the hotel, but it was on a busy street, so it was a bit noisy. Some guests arrived at the hotel at 1:30 am and rolled their suitcases on the bare floors, waking us up. At 5:30 when the alarm went off, the only people on the streets of Leon were 2 party-goers on their way home. This morning we left at 6:30 and after walking 30 minutes, we stopped for a cafe con leche and a magdalena. Then, we took off walking again. We passed lots of pilgrims and they passed us. There were several group of cyclists, who I did not envy. They looked cold and wet. It started raining about 30 minutes after we started out, but it was not cold. It rained lightly the entire morning and the ponchos that we bought yesterday really helped, but Tony’s is ripping down the front. At about 10 am, we came to a little roadside meson where we stopped and had another coffee and a big piece of potato omelet. There were about a dozen other pilgrims from all different countries in the meson. We spoke to a Polish woman who had walked a few days at the beginning of the Camino, then took the bus over the plains of Castilla and was walking once more. Feeling rejuvenated after putting more into our stomachs, we took off once more. At noon, we suddenly realized that we had arrived at our hotel, called Hotel Avenida III in Villadangos del Paramo! We were buzzed in at the front door, then a voice came out of a box on the front desk counter. It was the manager or owner and he was talking to us from the restaurant! He told us to take the hotel room keys, which are the plastic cards. We did, and waited while the housekeepers finished cleaning up the rooms. Again, the rooms aren’t fancy, but have everything we need. This hotel is two-stars and even has tennis courts and a fitness room with we will NOT be visiting. The church here has a very ornate and truly beautiful high alter, which I believe is from the 1700’s. 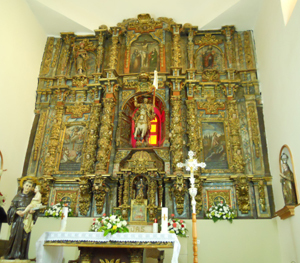 There are several representations of Santiago, or St. James on the altar. While we were visiting the church, a nice older Spanish lady, who seems to be one of the altar society stopped to explain to us the statues, history of the church, etc. She also told us about the “Beato” from the town, who was a young priest murdered during the Spanish Civil War. His photo is posted on a wall on the altar. « The Rain in Spain is Falling Everywhere, Not Just on the Plain! Como va eso familia?, Soy vuestro sobrino Daniel!! Ya veo que la suerte no acompaña con la lluvia!… Por aquí tampoco, ya que ayer la fiesta del Parral la pasamos totalmente mojados! Estuve mirando la predicción del tiempo y dice que es probable que llueva hasta el sabado…asi que no son muy buenas noticias!! Espero que siga todo bien! !… Os seguire siguiendo todos los dias!!! Marina on Welcome to Wanderings and Discoveries!